Great journalism is an art form. First and foremost it has to be factual. The magic is in the telling. Michael Lewis, of course, is the author who wrote the best-selling books that later became the hit films The Big Short, The Blind Side and Moneyball. In The Big Short, for example, he explained how an artificially-created housing boom led to the financial crisis of 2008, but he did it by telling the stories of a few odd ducks who saw disaster looming, bet on it happening (despite their sense of moral outrage) and made billions of dollars when it did. That’s part of Lewis’s genius: finding great characters to tell a ‘truth stranger than fiction’ kind of story. Who better than Michael Lewis to explain the Department of Energy and the U.S. Department of Agriculture and why they’re important to our safety and future well-being. He tackled the D.O.E. in the September pages of Vanity Fair. Two months later he was back in the magazine with an equally long piece on the U.S.D.A. Government agencies have huge staffs and even bigger budgets. Despite the fact there’s a big power change in Washington every four to eight years, the agencies are mostly staffed by career civil servants who keep their jobs when the new guy moves into the Oval Office. The people at the top almost always change–Secretary, Deputy-Secretary, etc.–but the worker bees tend to stay in the hive to continue their important work. To change an institution for the better, you first have to understand what you’re changing. Rules are meant to be broken, but why break them just because you can? Or before you’ve bothered to read the rules and tried to understand if they were put in place for a good reason? The D.O.E. is a $30 billion operation that employs about 110,000 people. Even assuming there might be a few dozen or hundred too many, it would be nearly impossible for every new administration to fire and replace such a large staff. Which begs the question, what exactly are they doing and is their work still relevant? As explained by Lewis, most people don’t understand what all the agency does, including brainy new hires when they first report to work. About half the agency’s annual budget goes to maintaining and guarding our nuclear arsenal. Two billion of that is spent hunting down weapons-grade uranium and plutonium that’s “loose in the world” before terrorists can get their hands on it. Sounds relevant to me. Particularly when I learned that the agency has hunted down enough of this dangerous material in the last eight years to make 160 nuclear bombs. Other worries? Our nation’s electrical grid. The D.O.E. is in charge of protecting it, even though they don’t run it. A patchwork of regional utilities provide our electricity, and these companies don’t have a coordinated plan in place in the event of–use your imagination. Last year the D.O.E. counted 500,000 cyber-intrusions into different parts of the U.S. electrical grid. They expect more in the future but at least their people are experienced and on the lookout. The agency has many other worries, but I’m going to jump ahead to the “The Fifth Risk,” as defined by a guy named John MacWilliams. He left when President Trump took office, but until then he was the Chief Risk Officer, a position created for him by former Secretary of Energy Moniz, a nuclear physicist who looks a bit like Einstein. MacWilliams is no slouch either. He’s an odd duck character only in the sense that he once quit Goldman Sachs to try writing novels. He graduated from elite schools, quit a top NY law firm to become an investment banker, then quit that, too, because he didn’t care for Wall Street. He ended up making a lot of money by starting an investment firm that focused on energy. When he took the D.O.E. job, excited to serve his country, he was surprised to discover what he knew about energy wasn’t all that much, comparatively speaking. The worker bees he met were “so impressive.” Physicists all over the place. “Guys who build bridges.” If there were overpaid bureaucrats who didn’t do anything, he never ran into them. He peppered the worker bees with questions. It took him about a year to begin to understand the scope of the agency and how much could go wrong. The problem with slashing their budget is that the new administration has spent a miniscule amount of time getting to know what the Department of Energy does, according to the people Lewis interviewed. Instead of descending on the agency in large numbers the day after the election–as most new administrations have done in the past–nobody showed up. The staff had been preparing for the handover for a year. They had no idea who’d win the election, but that wasn’t what was important. The work was important. One month after the election, one person stopped by for an hour. A former oil industry lobbyist who didn’t ask any questions or take notes. Later he did ask for a list of employees who’d attended climate change meetings in the past. An official at the time said it reminded her of McCarthyism. When Lewis interviewed former Chief Risk Officer MacWilliams five months after he left the D.O.E., he was the first person to do so since the election. Nobody in the new administration had ever talked to MacWilliams about what he did for the agency or what he was worried about. Former Texas Governor Rick Perry is the new Secretary in charge, but once when he was running for President himself, he said he wanted to eliminate three government agencies. 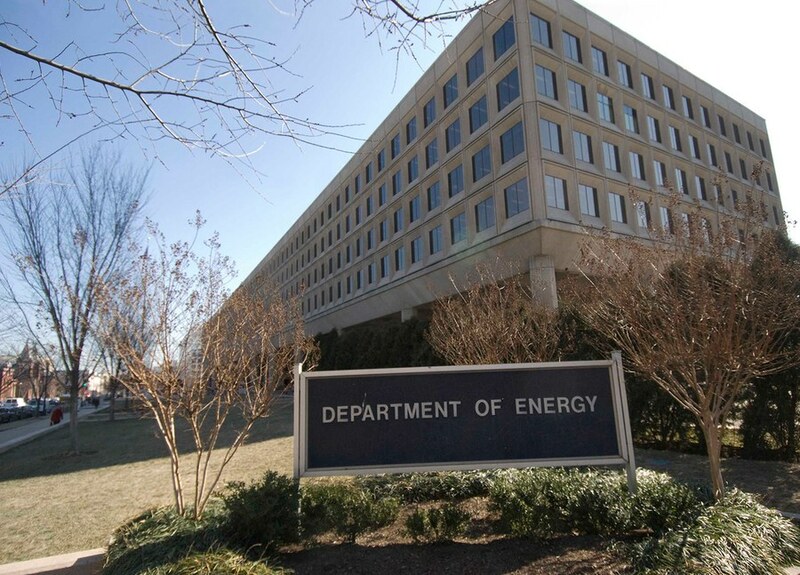 When he got to the third–the Department of Energy–he couldn’t remember its name. It probably shouldn’t be a surprise that he spent only minutes with his predecessor–Moniz, the nuclear physicist–getting up to speed. As a citizen, I’m thankful to Michael Lewis for all this insight. Whom I voted for has nothing to do with it. Presidents will come and go, but, really, the agencies were created for we the people. To help keep us safe. To improve the quality of our lives. If something a new administration does or doesn’t do defies rational thought, I want to know about it. I welcome your thoughts. Next time I’ll tackle some key things I learned about the U.S. Department of Agriculture. Loving Vincent is a gorgeous feature film about the final weeks of van Gogh’s life. If you haven’t seen it, I promise it’s unlike anything you’ve ever seen. Although animated feature films are nothing new, studios like Pixar and Disney have never worked their magic by commissioning 65,000 oil paintings (in this case, ones that mimic VvG’s work) and turning them into scenes. And, just to be clear, this movie was made for grownups. The film is stunning, wondrous, a work of art. While the story-telling isn’t quite as amazing as the artistry that went into creating the scenes, don’t let that stop you from seeing it. (My opinion: the story lags in the middle, but picks up steam at the end.) If you enjoy paintings, it’s like a trip to your favorite museum to see a special exhibit on van Gogh. Except it’s more alive, a more immersive experience. In the hand-painted opening credits, paint swirls onto the screen. It starts to look oh-so-familiar. Ohmygosh, it’s van Gogh’s Café Terrace at Night (you’ll recognize it when you see it). The painting isn’t static–it ripples with life. A man appears and walks into the café. The story begins and we’re off–seeing the world through van Gogh’s eyes. As Armand makes his way to Auvers, just outside Paris, he hears conflicting stories from people who knew or talked to Vincent. Flashback scenes are cleverly shot in black & white to avoid confusion, and they reveal information about the artist’s state-of-mind and early life. For me, one of the most heart-wrenching discoveries was learning Vincent had been given the same name as his older brother, who was stillborn a year earlier. Whenever Vincent visited the grave with his mother, he saw his own name on the headstone. The other surprise was learning how prolific Vincent was and how fast he painted, particularly since he was in his late 20s by the time he decided to become an artist. During the year he spent in the asylum (after the slicing-off-his-ear incident), he produced 142 paintings, including The Starry Night. From there he went to Auvers, where he was looked after by Dr. Gachet. He rented a room and created 68 paintings in the 70 days before the gunshot wound took his life. The actors in the film are more than just voices. They were chosen for their resemblance to real people van Gogh painted, real people turned into characters in the story. A couple of notable names: Saoirse Ronan, a Best Actress nominee for the 2015 film Brooklyn, and Jerome Flynn, who plays Bronn in Game of Thrones. The actors filmed all the scenes. Afterwards, every frame was projected onto a canvas and the artists went to work–125 of them. They painted over the scenes, not precisely, but in the style of van Gogh. What’s so fascinating is that about 1,000 canvases were re-painted an average of 76 times, as each frame was altered bit by bit until the last frame of the shot. The black & white paintings (or scenes) are different in that they were not based on van Gogh’s iconic paintings. They’re used as backstory or to show other characters remembering incidents involving van Gogh. Who are the filmmakers? A husband and wife team who wrote and directed. Hugh Welchman is a British animator. Dorota Kobiela is Polish, and she trained as a painter before switching to film. 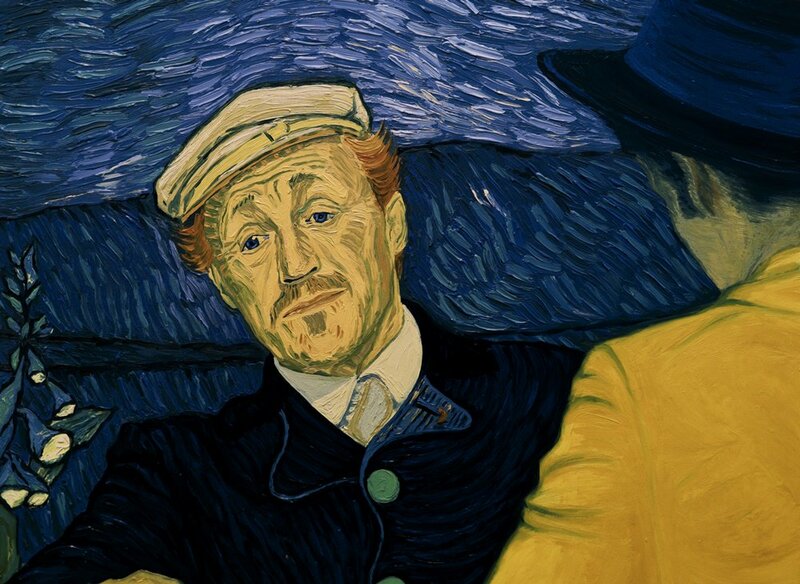 Loving Vincent is clearly a labor of love, many years in the making. The work began in 2008. Dorota was looking to combine her love of painting with film. She’d read van Gogh’s letters and been moved by them. Convinced that his own paintings were the best way to tell a story about him, she envisioned painting a very short film. Then she met the man who would become her husband, and the idea expanded into a feature-length film that’s now being released in 130 countries. It’s heart-breaking, and yet the world is a more beautiful place because Vincent van Gogh followed his heart. As did the filmmakers.